Long before it became popular in beauty makeup, airbrushing has been a staple in the special effects industry, as the amazing show Face Off demonstrates in every episode. We will be talking more and more about FX on these pages, and what better way to start on the subject than an interview with one of our favorite Face Off alumni of all times: "RJ" Haddy! Please click on each image to see every amazing makeup in full size. Robert"RJ" Haddy is a terrific special effect artist with extensive movie credits and impressive teaching experience. 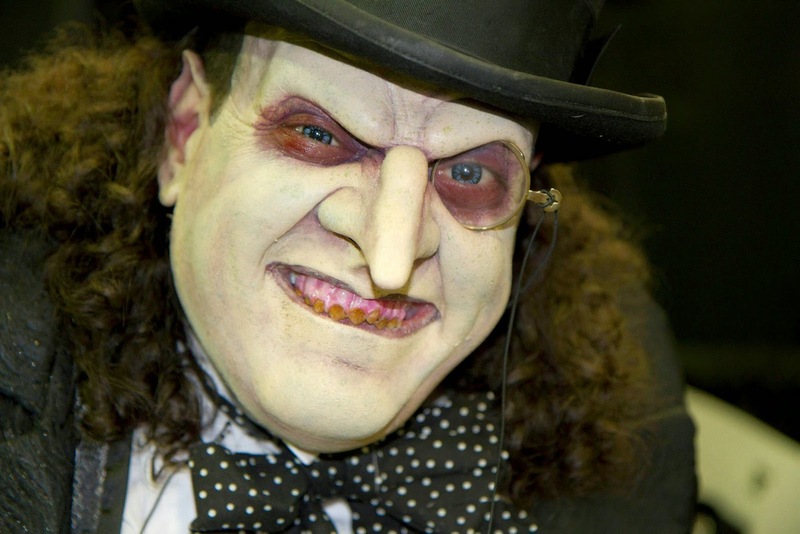 A native of Charleston, West Virginia, He has become a household name to FX fans world wide thanks to his double stint in Face Off, the SYFY hit reality competition show that has played such a major role in bringing the world of special effects makeup to the mainstream public. RJ was one of the three finalists of season two, and returned for a further five episodes for the show's fifth season, an atypical "veterans vs newcomers" edition. His Bell Hop makeup, inspired by the imagery of Tim Burton, was one of the most memorable looks ever featured on the show, and in my opinion it sums up RJ's most prominent trade mark, with its mixture of perfectly executed makeup, inspired fabrication and superb attention to details, all accompanied by an irresistible underlying sense of humour. Since the show RJ has kept an incredibly busy schedule, teaching highly praised courses and seminars and being featured prominently in the most important makeup related events around the US. 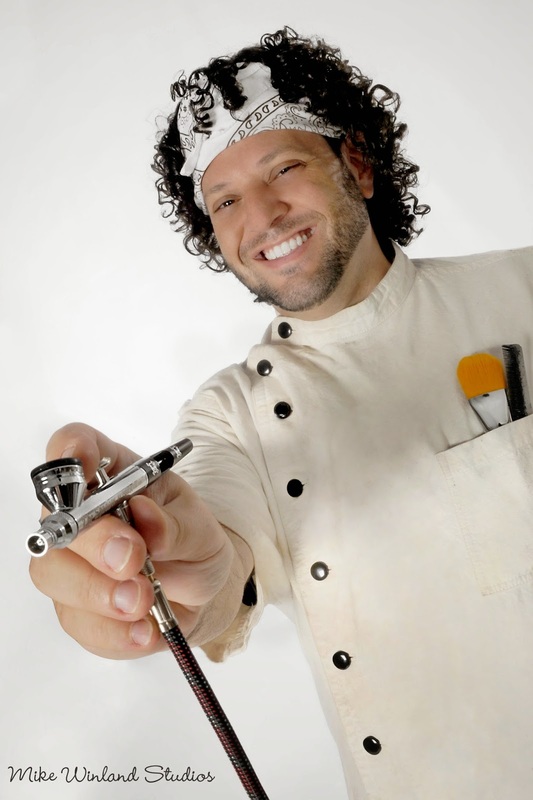 RJ has his own product distribution website, www.radfxco.com, and has also achieved what to us airbrush makeup fans is the ultimate accomplishment: he has designed a signature airbrush called "The Shadow" with Leading American airbrush brand Paasche. We are very excited to be able to ask RJ a few questions on his life and his art. Well I started out as a puppeteer when I was very young building and creating puppets, and it sorta transformed (or transgressed if you will LOL) to FX make up because the techniques and materials for more advanced puppetry are almost identical. In fact it's FX artists that create all the animatronic monsters you see in films. -During the course of FaceOff you often described the beautiful relationship you had with your parents. Were they immediately supportive of your passion for FX? Not from the get go. I think my mother still wants me to become a dentist or a doctor at some point, lol but once they saw what I could do that I was pretty decent at it and could make things with my hands they became very supportive. -You are a graduate of the celebrated Joe Blasco Make up Artist Training Center in Hollywood. How difficult was the transition into the professional working world after leaving school? Actually, if there was one thing that was the best help of attending Joe Blasco it was the preparatory for how to find and procure jobs: that was the most valuable information parlayed to me through the courses ... I was already a pretty decent make up artist by the time I got there but had NO clue about how the business of films worked or how we as make up people were to find jobs and work in the industry. So for that reason above all others it was beneficial and worth being in school. This is business stuff that you can either learn by getting thrown to the wolves and making lots of mistakes, or from someone a little older and wiser, and that was a HUGE help! -Your original creations seem to be conceived with performance in mind, as opposed to static beauty, and I know you have some acting experience already. Do you imagine yourself pursuing acting more in the future? -I would like to move on to our favourite subject now, which is of course airbrushing. Face Off did an incredible service to this technique simply by showing how much it is actually used in the FX world. A lot of our readers, especially here in Europe, had no idea of the extent of its use until they saw the show. When did you first learn how to airbrush? I picked up my first airbrush, a Paasche VL, when I was 13 years old. I was instantly hooked, but I was also a stupid kid, lol ... I didn’t understand the importance of or how to clean one properly until after I went to Joe Blasco. Cleaning is VITAL to keeping your brush in proper working order! Not tomorrow, the next day, or next time you use it but IMMEDIATELY after usage and before you store it. TRUST ME! It really is a key component in speeding up the entire process. -What aspects of airbrushing that you like most, and what in your opinion is the greatest misconception in regards to this technique among young makeup artists today? Well That's a tough question.... but I guess I can summarise it in this way: an airbrush could make a MONKEY look like they know how to paint. I recently did a make up that was a typical “cracked doll make up” for a client. I decided I would paint the cracks in by hand the first day. The second day I used the airbrush to paint in the cracks and the difference was astounding. I didn’t think it would make that much of a difference, but it was just a more complete, uniform look. Also I love the process of painting in thin translucent layers. You can get the thin washes of colour layered one on top of each other until you have sufficiently created the illusion of the translucency of real skin. That is VERY important. It has to be broken up. You can't just leave a porcelain doll finish on a character make up (unless its a porcelain doll, lol ) and think that's finished. The look is created by layering many many thin washes of colour in organic patterns. Ve Neil would say to me on the show: “Your paint jobs are nice but they’re a little flat ...” well I learned how to fix that throughout the 2nd season on Face off. This was the most invaluable technique I took from the show. The way something is painted can destroy a beautiful sculpture, or save a mediocre one. -You had the amazing opportunity of creating your own signature airbrush with a major company. 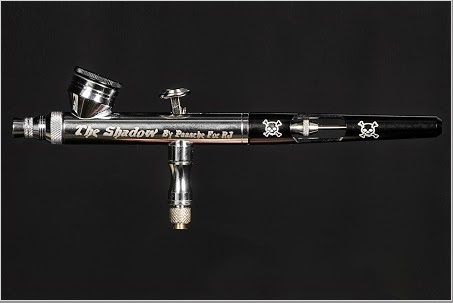 What makes "RJ's The Shadow" different from other airbrushes? Well first and foremost, Paasche is an American Made product. (SORRY EU! lol) but honestly that is very important to me, keeping people in jobs and manufacturing a high quality product at the same time. Secondly the price is VERY affordable at US $155 its FAR less than other brands of the same quality. Third point it has a 3 year warranty not the usual 2 year warranty. About specific stats, the cup is smaller because I specifically asked for that. As I blow through colour quickly and want to move on to a new choice its much easier than emptying out the cup cleaning out the residue and when you are on Face OFF trust me, time to clean an airbrush is NOT available. We also have developed a special needle and tip for the gun that sprays at .32mm, which is in between the Talon airbrush standard of .25 (fine) and .38 (medium). This is a neat little bonus that the Shadow has over the other guns. The gun comes installed with that set at time of purchase but it also includes in the box a tip, needle, and cap for the size .25mm fine spray, if you wish to get down to finer details. All Talon Parts will interchange with the Shadow as well. So if you already own a Talon this is a perfect complementary gun to set up next to it. I set up three or four guns when I am working and have the quick change fitting on my hose and I just pop back and fourth between those guns.... its so much easier! -Is there a kind or brand of paint/makeup you prefer to use in your airbrush? European Body Art, the Endura line specifically. It's amazing and it paints anything! Skin, Silicone, Hair, Latex, Foam Appliances, Fabric. Its tough as nails but gentle on the skin. It's the best paint out there. I always cut it with 99% and thin it because its just a great highly pigmented paint.You can use it full strength if you want to but I prefer to thin it, you can essentially stretch a 1oz bottle into a 2 oz bottle so you definitely get your moneys worth! -We follow you on Facebook and Twitter, and we love to see how phenomenally busy you are. What future goal would you like to reach in your career? -Finally, going back to Face Off, is there an aspect to the show that is less apparent to the public, but that was important for you as you actually went through the experience? I think definitely the one thing none of us realised or counted on was the fact that we would become such good friends and close through the experience. Now after seven seasons it's become like an exclusive fraternity/sorority where you all have a common background of having been through this “trial by fire” so to speak. That's been the biggest reward of it all as well! I'm incredibly close to several members ... Beki Ingram, David Greathouse, Roy Wooley, Nix Herrera, Frank Ippolito, Rod Maxwell , Jerry Macaluso, Scott Ramp, Brea Joseph and Athena Zhe who was crucial to my team in the season 2 final. And of course I cant forget my fellow finalists from season 2 Rayce Bird and Ian Cromer.... that's just to name a few. They are all wonderful. They have become wonderful confidants and friends because of the experience. The friends we’ve made at SYFY and the production company Mission Control ... the casting company Pittman Casting ... All amazing people and truly wonderful friends! RJ's love for fun in his work and his unassuming, lovable character make him the makeup artist you would love to work with and the teacher you would die to learn from. We look forward to meeting him at one of his courses one day, and to reviewing "The Shadow" on these pages soon. Really wonderful interview ! Create some really beautiful work !